My current PhD research is focused on looking at animals in ritual, so I’ll be making short blog posts examining the different ways animals are seen in cosmological contexts as part of my own contribution to the #FolkloreThursday feed on Twitter. A wood pigeon skull with its ulna – note the notches on the ulna, where feathers would attach. In my recent work with mixed assemblages involved in funerary rites, I’ve come across many bird bones. At this preliminary stage in my research, it appears that butchered birds may have been incorporated into rites performed at this site. But why birds? What’s so special about them? Birds, barring a few examples, have the unique ability to fly. To those in the past, this was probably acknowledged as an act emblematic of supernatural power, the ability to move from the heavens to the earth with ease. Birds were considered divine messengers, whose appearance could indicate an omen from the gods and goddesses above (Green 1992). Shamans in various communities have been noted to adopt aspects of the bird in their work and appearance; this displays their power of “flying” from one world to the next (Eliade 1964). Throughout later prehistoric Europe, birds continued to have an association with the mystical and the magical. Birds such as ravens and crows have been known to “talk”, which ultimately associated them with divination and prophecy (Serjeantson and Morris 2011). Birds of prey and scavenging birds were most likely incorporated into funerary rites involving excarnation, or the defleshing of a body – this, in turn, led to an association of these birds with death (Harding 2016). Wild birds appear to have been hunted, but not necessarily eaten – perhaps these birds were participants in ritualistic hunting? These beliefs have been observed in various artefacts from the later prehistoric – this includes Iron Age art depicting wings, drinking vessels decorated with waterbirds, and even weaponry and armour using bird motifs (Green 1992). Of course, these aren’t the only instances of the magical properties of birds – we see this in various myths across cultures, from Odin’s ravens to Athena’s owl. Birds continue to be associated with the magical to this day…what would Harry Potter be without Hedwig, after all? 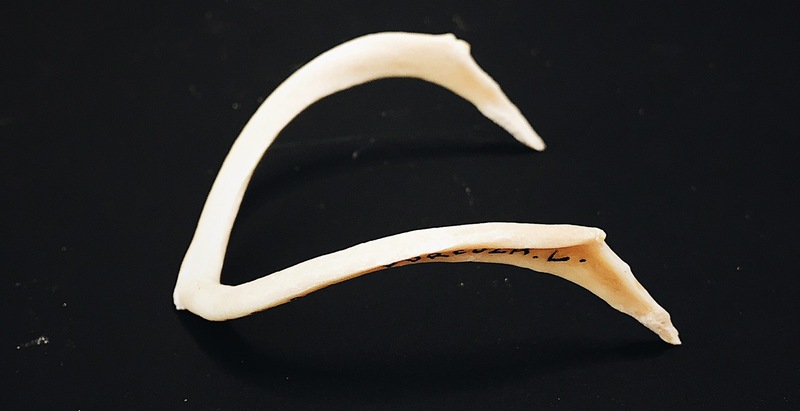 A comparison of different birds and their ulna bones – (top to bottom) herring gull, eider duck, and magpie. Again, note the notches for feathers! Eliade, M. (1964) Shamanism: Archaic Technique of Ectasy. London: Routledge & Kegan Paul Ltd.
Green, M. (1992) Animals in Celtic Life and Myth. London: Routledge. Harding, D. W. (2016) Death and Burial in Iron Age Britain. Oxford: Oxford University Press. Serjeantson, D. and Morris, J. (2011) Ravens and Crows in Iron Age and Roman Britain. Oxford Journal of Archaeology 30 (1), 85-107. Maybe this is a real “duh” moment for me, but the first time I picked up a bird bone (and a rather large one at that), I was genuinely freaked out by how light their bones are! Thinking back, of course, it seems a bit obvious why bird that fly would need relatively lighter bones, but in my defence, it is very unsettling to have a bone be so light when you’re not expecting it. One of the skills you learn going into zooarchaeology is quickly finding indicators that allow for relatively quick identifications off-hand. Of course I’m not gonna hand in a bone report made up of five second IDs, but when you’re faced with a pile of hundreds of animal bones, it does help to do a little preliminary analysis using a few indicators you know. The bird ulna is part of the “forearm” and I find that they can often be ID’ed by these bumps that are found running along the bone. 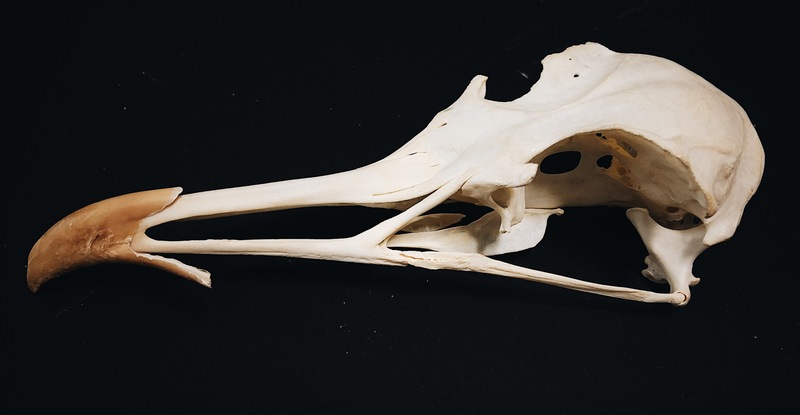 The clavicles of a bird are fused together into an element known as the “furcula“. This is also what is often referred to as a wishbone. Given this is a unique element in birds (and some dinosaurs apparently! I don’t know much about dinosaurs and their skeletons, but I can at least identify the furcula if present – it’s a bit impressive to kids, at least), the presence of this bone should be a giveaway that you’ve got a bird on your hands. This isn’t an extensive bird identification manual (although hey, maybe that’s a post for another day? ), but again, I find that having these small little hints tucked away are handy for getting a start on IDing bones. Look for more of these kinds of posts in the future!